voices of toronto — what would you like to say? Globally, there have been very loud, divisive voices that seem to have a strong platform. We believe there are many voices that have not been heard as loudly yet, ones that value respect, diversity and inclusion. We’d like to capture what you’re experiencing in this climate, and what your hope is for our shared communities. Please write a few words or thoughts at the link below. 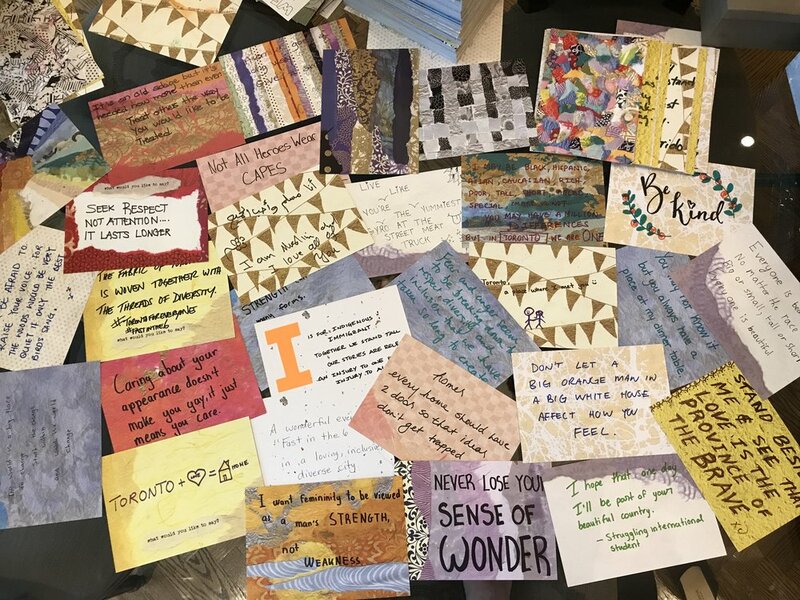 Submissions are anonymous, and a selection will be printed on a beautiful 5”x7” card that will be linked into an art installation, Voices of Toronto, representing thousands of voices in our city. These cards were lovingly hand-made in our kitchen using scraps of paper to create collages that represent the mosaic that is Canada. You can write about impact. You can write about your hopes. Just please say something. Creative Team Camille Hutcheson, Susan Farrow and Jennifer Pernfuss. All voices received are the sole and exclusive property of what would you like to say. All entries will be anonymous, and may be used in future art installations and publications. Voices of Toronto book coming soon! Thank you for your submission, your voice has been heard. You may also use the above form to contact us about booking an exhibition.